with ISIS as the IGP with ISIS Wide Metric, also they are running LDP Protocol for label exchange bindings. IPv6 and CEFv6 are enable are enabled the 6PE neighbor is activated, and aggregate label binding and advertisments is enabled for IPv6 using the neighbor send-label. When the neighbor relationship comes on, lets see the BIG output from the show bgp ipv6 neigh.. just for history..
2001::1/128      ::                      64         32768 ? 2001:0:1:15::/64 ::                       0         32768 ? i2001::3/128      ::FFFF:6.6.6.6          64    100      0 ? i2001:0:1:36::/64 ::FFFF:6.6.6.6           0    100      0 ? i2001::1/128      ::FFFF:5.5.5.5          64    100      0 ? 2001::3/128      ::                      64         32768 ? i2001:0:1:15::/64 ::FFFF:5.5.5.5           0    100      0 ? 2001:0:1:36::/64 ::                       0         32768 ? 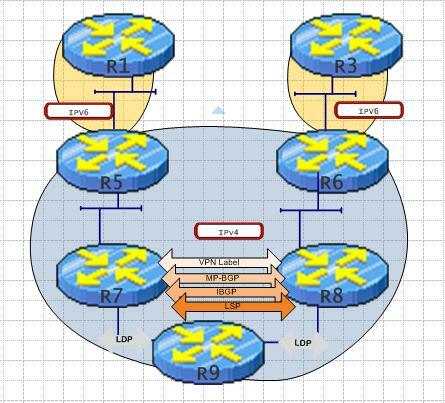 configuration are using only LDP and ISIS, you can use TDP or RSVP for binding Ipv4 labels. Within this network, IPv6 traffic is forwarded using label 24 assigned by R6 to reach R3 loopback , which makes the IPv6 traffic transparent to the core of the MPLS network. MPLS is a very FUN Technology!!! This entry was posted in Cisco, IPv6, MPLS. Bookmark the permalink.